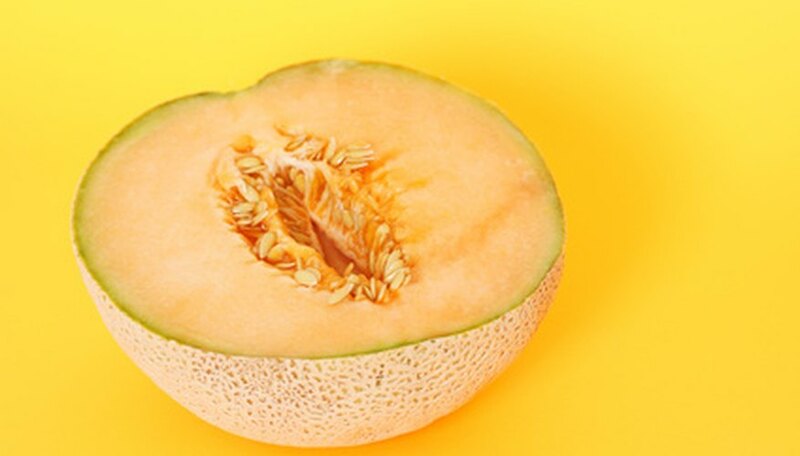 Ambrosia muskmelon, more commonly referred to as cantaloupe, is a hybrid melon bred for its sweet juicy flesh and heavy aroma. These 6-inch melons mature in 86 days and produce abundant fruits. Although muskmelons (Cucumis melo reticulatus) and cantaloupes (Cucumis melo cantaloupensis) are two different plants, the names are used interchangeably in the United States, with muskmelon seedlings or seeds labeled as cantaloupe. Some sources include both names. Prepare the soil in a sunny location that receives six to eight hours of direct sunlight a day. Afternoon sun is preferred as muskmelon thrives in warm soil. Till to a depth of 8 to 10 inches and remove rocks, sticks or roots uncovered in the soil. Mound soil into hills approximately 4 feet in diameter and raised 6 to 8 inches above the existing soil in the garden. Space mounds 4 feet apart. Add a 3- to 4-inch layer of compost or well-rotted manure and work in well with the hoe or garden rake. Apply 10-10-10 fertilizer following the manufacturer's application rate and mix in well. Cover the mounds with black plastic or landscape fabric two to three weeks before planting time to allow the soil to warm. Secure the ends of the plastic with rocks or bury into the soil to prevent it from blowing free in the wind. Plant seeds when the soil has warmed and all danger of frost has passed in your area. Plant three to four seeds in each mound to a depth of 1 inch and cover with soil. Firm down to remove air pockets and secure the seeds. Water to thoroughly moisten the mound. Water to saturate the mounds once a week and allow the soil to dry slightly before watering again. Typically, watering once a week is sufficient, but during periods of drought, more frequent watering may be required. Side dress with high nitrogen fertilizer when the plants send out runners (secondary vines growing off the main vine). Apply 1 to 2 tbsp. 34-0-0 fertilizer per mound, working it into the soil 6 inches from the base of plants. Harvest approximately 6 weeks after blooming. Look for yellow skin with defined netting. Stems slip free at the base of the melon when it is ripe. Start seeds inside three to four weeks before planting time to get a head start on summer. Plant in individual peat pots and plant the pots in the soil to reduce root damage when transplanting.